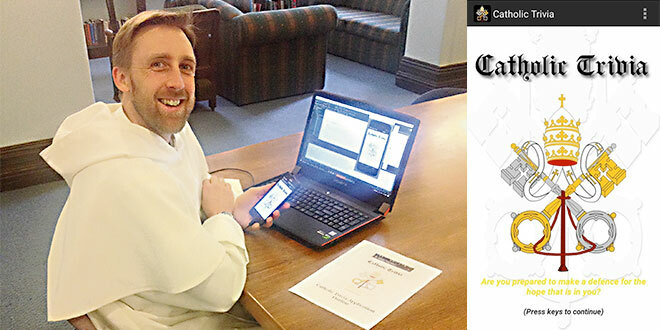 Game on: Dominican Fr Matthew Boland was one of five members of the Order who have developed Catholic Trivia, a free game for Android smartphones. DURING an interview with American TV host David Letterman, what did Justin Beiber call the Sistine Chapel? If you answered ‘the Sixteenth Chapel’, you’d be on your way to reaching the top-secret level of a new Catholic Trivia app designed by a group of Australian Dominican Friars. In 2013, five men studying for the priesthood with the Order of Preachers sat down to develop an app for spreading the Catholic faith. Among the five students was Fr Matthew Boland, then an unordained former publican and hotel manager who also happened to have graduated from a free online course in computer science from HarvardX. Fr Boland, 40, worked on a personal project for the Android operating system, a self-timed whistle that coincided with a popular 7 Minute Workout app, while in the Order. It was his first major work in the app development industry, but not the last. “Actually the reason I wanted to do this was because I used to go looking for Catholic apps on Android,” Fr Boland said. Fr Boland decided the small team of student Friars couldn’t muster up a complex app the likes of Pokemon Go, but they could leverage something no other development team had. “I thought we needed to play to our own strengths,” Fr Boland said. That advantage led to Catholic Trivia, a free gaming app designed to test a player’s knowledge of the Catholic Church. In Catholic Trivia, gamers can answer up to 1250 questions on six categories – Art and Literature, Biblical knowledge, History, Liturgy and Customs, Saints and Personalities, and Theology – across five levels of increasing difficulty. The large database of questions offers ample replayability, meaning no two versions of play will be the same. “The idea was in the first levels, any Catholic or even non-Catholic, would be able to answer the questions, but as you go up it gets harder,” Fr Boland said. There won’t even be penalties if players use Google to answer questions. “We’re totally fine with it,” Fr Boland said. “If people are Googling for the answers, that’s probably a good thing. “If there’s a question about a Pope and they want to research into it, go for it. Trivial moment: Players start Catholic Trivia as a Novice and receive new titles as they progress. The top two levels have not been disclosed. Speaking two days after the launch of Catholic Trivia, Fr Boland was surprised to find the app had already been downloaded 50 times around the world and given seven five-star ratings. “There was eight but I removed the one I did,” Fr Boland laughed. The positive feedback is an encouraging sign for a group of five Dominicans, who spent every free Saturday between studying for the priesthood and praying, creating a game for Catholics. All but one are now ordained for the Order. “We came up with the categories, and the different levels, divided up the questions and went away and wrote all the questions,” Fr Boland said. Once they had a fair mound of easy to impossible-to-answer-unless-you’re-the-Pope questions, Fr Boland got to work writing the codes, firstly using an Integrated Development Environment, Eclipse, and then Android Studio when it was released. It took three “time-consuming” years for the game to reach launch status on October 4, a few months after Fr Boland’s ordination in July. Releasing the game on the Android platform, which in 2016 held 87 per cent of the smartphone market share, was a deliberate decision. “Around a billion people have an Android phone, and that was a major influence in the number of people we can reach,” Fr Boland said. “The problem with Android devices is they are all different shapes and sizes, so I had to code for them all. While the technical side of the app has kept Fr Boland busy, the other Friars had their place in developing the game. One is former lawyer and offered legal advice to the group, another a former psychology graduate who helped choose the colours used within the game. Sydney Archbishop Anthony Fisher, also a Dominican Friar, gave the permission to use the name Catholic in the app. 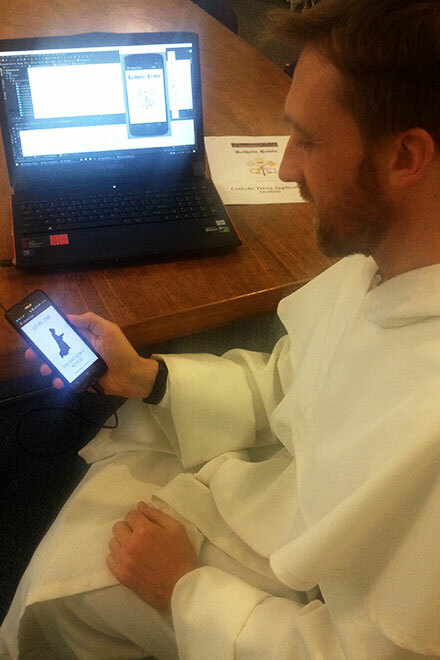 All their efforts and 50-plus downloads later, the Dominican Friars have their first app. Fr Boland’s next step is learning “a new language” to develop the app for the Apple operating system, and at the writing of this story, incorporating a leader board, achievements and social sharing. He said the Dominican Friars themselves demonstrated how the app could be used in a group setting. In a recent meeting of the Dominicans, Fr Boland presented the app “over a cup of tea” that led to a “very engaging” game of trivia. “They were getting quite involved, some were annoyed if they got the answer wrong,” he said. Now the Friars will sit back and watch the downloads. “I don’t even know if it’ll even get off the ground,” Fr Boland said. “Like many apps, it might do really well, then disappear and go off the radar. Find the game at the Google Play store or search the store for ‘Catholic Trivia’. Parenting Q&A: How do I keep my children off their smart phones?